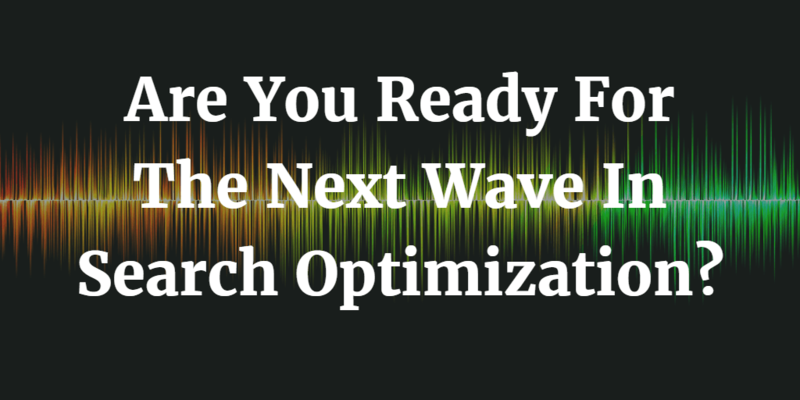 Are You Ready For The Next Wave In Search Optimization? Home » SEO » Are You Ready For The Next Wave In Search Optimization? Search engine optimization (SEO) is an ever-changing practice. You can never perfect it, as the requirements and rules are always in a constant state of change. While many things have remained fairly steady for some time, there’s a new need on the horizon. Are you ready for the next wave in search optimization? Forget Penguin and Possum, there’s something new we need to focus on. Voice search optimization is about to become big. With the explosive growth of the Internet of Things (IoT), voice search devices are growing fast. VoiceLabs estimates that there’ll be more than 30 million voice search assistants in US homes by the end of 2017. With each of those devices being used to search for everything from where to eat to ordering underwear, there’ll be a whole lot of voice search happening in the near future. While the purpose of voice searches is the same as text searches executed on computers and mobile devices, the way we search is different. With years of text searching under our belts, we generally cut the extra characters and get right to the point. “Percentage of US homes with internet access” or “Years the Yankees won the World Series”. Our current way of optimizing sites for search takes this into account by putting our focus on very specific keywords and keeping even long-tail keywords fairly trim. Voice searches are different. They tend to be more natural inquiries, in the form of a question. “What percentage of US homes have internet access?” or “Which years did the Yankees win the World Series?” While similar, these queries are slightly different and can be optimized for slightly differently than standard searches. By integrating the natural questions we ask when voice searching, we can optimize our content to answer them in a more natural way, and be the best answer to these type of searches. The next wave of search optimization is coming. With millions of voice search assistants in homes, plus the hundreds of millions of smartphones with Siri and OK Google, voice search is going to grow rapidly. Those optimizing for these search queries now will be ahead of the competition when they finally take notice, and grab up additional search traffic by being ahead of the pack. Think about the questions your website can answer. Start building and optimizing your content so that it can answer the questions we’ll all soon be asking voice assistants.